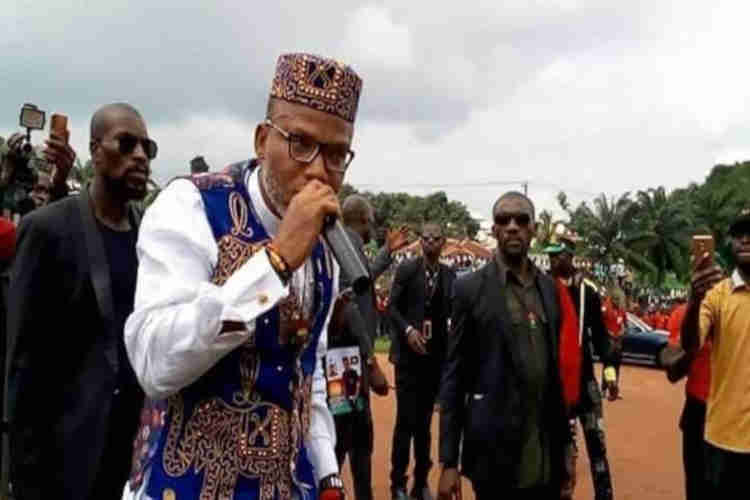 The leader of the Indigenous People of Biafra, Nnamdi Kanu, has boasted that he has the capacity to cause war in Nigeria if the government of President Muhammadu Buhari provoked him. The IPOB leader dismissed the effort of the Nigerian government to arrest through the International Police as a dream. The IPOB leader reminded the APC-led government that he’s a British citizen and so could not be subjected to any Nigerian law. He said Nigerian government doesn’t have the power to order his arrest, stressing that the bail revocation was a ploy by the Buhari-led government to make the International Police stop him from travelling freely across the world to make a case for the independence of Biafra. “SO, I AM WAITING FOR THEM. EUROPE AND INTERPOL ARE NOT A BUNCH OF WILD BEASTS LIKE NIGERIAN LAW COURTS AND HER SECURITY SERVICES. IN EUROPETHERE IS RULE OF LAW WHICH IS ALSO BINDING ON INTERPOL. Recalled a Federal High Court sitting in Abuja a few days ago ordered the re-arrest of the leader of the Kanu. The court gave the order today, March 28th, after revoking the bail earlier granted to the IPOB leader in 2017. Immediately the re-arrest order of Kanu was given, the Ohanaeze Ndigbo Youth Council (OYC), issued a statement, saying such order may disrupt the fragile peace in Southern Nigeria, especially Southeast and South/South. “OHANAEZE YOUTHS IS USING THIS MEDIUM TO CONVEY OUR MESSAGE OF PEACE TO IPOB LEADERSHIP TO RESIST ANY TEMPTATION TO ALLOW NNAMDI KANU TO RETURN TO NIGERIA, AS THE HEALING PROCESS OF THOSE SLAUGHTERED DURING THE FIRST ARREST AND OPERATION PYTHON DANCE HAVE NOT BEEN COMPLETED…” A STATEMENT SIGNED BY ITS NATIONAL PRESIDENT, MAZI OKECHUKWU ISIGUZORO AND SECRETARY GENERAL, MAZI OKWU NNABUIKE IN ABAKALIKI, SAYS. FG hasn’t reacted to his latest statement.